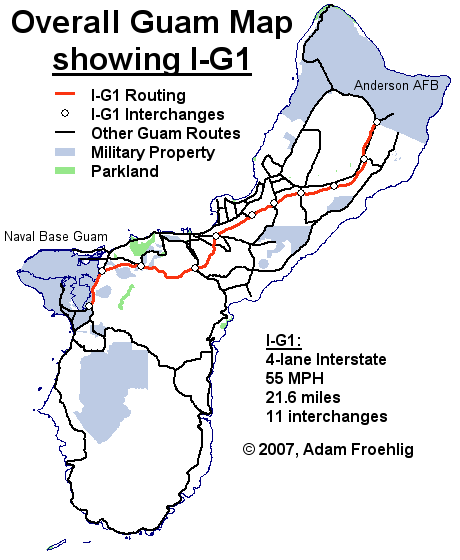 I-G1 is my idea for a roughly 21.6 mile long "Interstate highway" on Guam, connecting the two largest military facilities on the island: Anderson Air Force Base and Naval Base Guam. The Interstate would also serve populated areas through the central part of the island and connect to Guam International Airport. My fictional I-G1 would be a 4-lane Interstate, beginning at the main gate of the Naval Base and running east-northeastward, generally parallel to and south of GU 1 (Marine Corps Drive...the existing route between the two bases and the busiest road on the island). There would be 11 interchanges along the corridor, generally at major intersecting roads. This map shows the overall location of Fictional I-G1 on Guam, as well as in relation to other signed Guam routes.